NordicTrack X9i Incline Trainer Review by Industry Experts! The NordicTrack X9i Incline Trainer is ON SALE! The NordicTrack X9i Incline Trainer is their #1 selling treadmill. 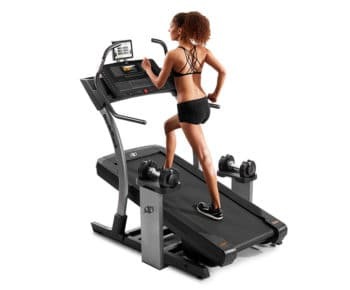 NordicTrack first started selling Incline Trainers six years ago. Since then, they have continually grown in popularity. Incline Trainers are very effective in helping people burn calories, lose weight,and get in shape. For those not familiar with the Incline Trainer, it is basically a treadmill that inclines to extreme levels of up to 40%. These machines are generally used for walking because of the extreme incline, although they can also handle running. MID-WEEK SALE ENDS THURSDAY: The NordicTrack X9i Incline Trainer is currently OUT OF STOCK. Instead, check out the NordicTrack x11i. You can get the same intense cardio workout from running while walking. It is similar to hiking up and down a steep mountain. Since you’re walking and not running, there is less stress on your joints and back. However, many individuals still use the Incline Trainers for running. With the X9i you can either walk at steep inclines, or run at a more level incline. Of course, if you are a fanatic you can run at steep inclines, but probably not for long. 7″ Smart HD Touchscreen —The NordicTrack X9i Incline Trainer has a really nice 7″ full screen touch display. The colorful display shows features and programs along with your iFit stats and virtual course views. 40% Incline and -6% Decline — Being able to incline the deck to 40% allows you to get one of the most intense workouts you will find on any cardio machine. The ability to incline the NordicTrack X9i so steeply means you can burn calories efficiently without the stress and strain that comes with running. In fact, the company claims you will burn five times the calories in comparison to using a normal treadmill. In addition to inclining the machine, you can also decline the X9i to -6%, which allows you to simulate hiking down hills. This allows you to target different lower body muscles. 22″ x 60″ Treadbelt — The long treadbelt makes the X9i more practical for running. The extra width gives you a more comfortable walking surface. iFit Live Coach Ready— With iFit Live, you can combine the incline and decline features with Google Maps and experience hiking trails virtually around the world. You can view your progress on the color display by selecting a predefined route, or mapping out your own route. The NordicTrack X9i Incline Trainer will simulate the ups and downs while providing you with either a satellite, Earth, or street view. We’ve mapped out streets in local neighborhoods and were impressed with how accurately it simulates going up and down hills. How do they do that? In addition, you can define your fitness goals at iFit.com and receive an 8-week personalized training routine designed by Jillian Michaels. She provides audio coaching as you workout. 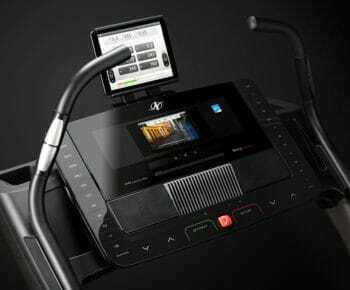 A new workout is sent through WiFi and automatically downloaded to your Incline Trainer X9i. The results are recorded in real time to your iFit.com account, allowing you to track your progress. Included with iFit Live are HD videos of world famous terrains. You can run though stunning mountain or oceanfront scenes. Like with Google Maps, the treadmill will simulate the terrain as you run. An additional subscription fee is required to access the features. This model does come with 1-year FREE iFit membership, but you need to pay after the first year. Some of the competitors have fitness tracking programs available at no cost. Also, take a look at the NordicTrack x22i with a 22″ Smart HD Touchscreen or the NordicTrack x11i with a 10″ Smart Touchscreen and 4.25 CHP motor. 3.0 Continuous Duty HP Motor — The motor has ample power to run effortlessly at higher inclines and speeds. It comes with a lifetime warranty, which means it virtually never has problems. Heart Rate Monitor with Wireless Chest Strap — For those who want to optimize their workout, the NordicTrack X9i Incline Trainer allows you to control the level of your exercise with your heart rate. This is a technique that is popular with professional athletes. 44 Workout Programs — Included are 24 workouts that target calorie-burning, incline or intensity goals. In addition there are 20 preset iFit Live™ Workouts , which include training with Jillian Michaels, workouts Powered by Google Maps™, event training and a goal-setting center. Heavy Unit Weight — The NordicTrack X9i weighs approximately 350 lbs., giving it a very solid and stable feel. You will definitely want to get the inside delivery option. Speakers with MP3 Input — The treadmill has two 3″ speakers that have better clarity than you will find on most fitness equipment sound systems. Warranty — This machine comes with ample coverage, which suggests this is a very durable machine. The warranty provides lifetime frame, deck and motor, 5-year parts and electronics, and 2-year labor coverage. Full Color 7″ Touch Screen Display with Android Browser, which allows you to experience the full impact of iFit Live, in addition to being able to browse the Internet. During a conversation with one of our contacts at the company he mentioned that the majority of the employees who bought a product through the company selected an Incline Trainer. 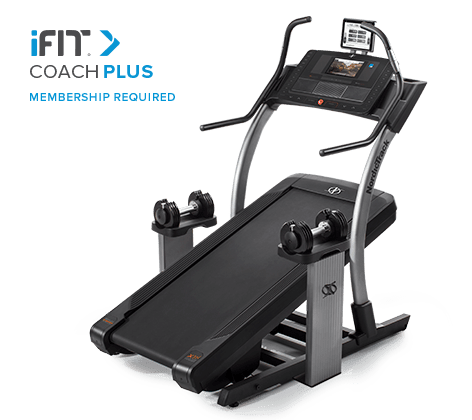 So the question is – do you want to spend $2,000 on the premium NordicTrack Incline Trainer, or get a heavy duty treadmill for the same price? That really depends if you are sold on the concept of extreme incline training. As mentioned, you can get an intense and efficient cardio workout while walking. This reduces the impact that comes from running. We’re sold on the concept and would seriously consider an Incline Trainer for a future cardio equipment purchase. This is especially attractive as age sets in along with its aches and pains during exercising. Go to www.NordicTrack.com to learn more. My name is Karl Wm Steuk and I purchased a Power Tread Plus the 16th of Feb 1997, and over the years I attribute the PTP in part to my present good health at 77 years old, I give thanks to God for His blessings, Pat’s concern for my diet and very good medical doctors, and a caring wife. Along the way I had two heart surgeries to correct small arteries before experiencing a heart attack! My Power Tread is showing signs of aging, the treat belt needs repair or replacement, but with care and a patch we continue to exercise four or five days a week. I was viewing your present units that are similar to the PTP and I am looking for your suggestions going forward. I also had a Pro Plus Skier for many years, but I always came back to the PTP and the PTP always won out and I retired the PPS several years ago. I continually monitor my heart rate and BP as will as all the meaurements on the PTP, I watch and monitor all the numbers flash, they set goals as I am running along and sometimes I want to stop short of my set time, but I keep going “as long” as I feel fine. lastly, I was a commercial pilot since 1960 and due to the heart surgeries the PTP enabled me to recover quickly and resume my flying career, however, today I am too old to qualify for commercial flying so my lovely wife and I, both pilots, continue flying our small Piper four seat plane all over the US. Thank you for your suggestions and I hope the old PTP will stay healthy until I select a new treadmill partner. 17522 North Eagle Crest Dr.